Whether you consider them centers of discovery or lairs of evil geniuses, you probably have some mental image of a scientific lab (or la-BOHR-atory, for you evil geniuses). There’s the row of white coats, the cabinets of mysterious glass bottles, and, always, the machines. Blinking and beeping, these instruments, as they are more formally known, are an undeniable part of the archetypal lab. Oceanographers use such devices every day, which is straightforward when their lab is tucked inside a building but becomes complicated when it is aboard a research vessel. When oceanographers go to sea to conduct research, at least portions of their labs must go with them so they can process samples and collect accurate data. But what about scientists 150 years ago, before it was even possible to bring electronic equipment to sea? How could they complete the most basic tasks, like measuring the depth of the water beneath them? Considering the challenges of early science affords a greater appreciation for the convenience of modern instrumentation and the resourcefulness of early scientists. A scientist today may insist that she cannot fathom approaching scientific research in the style of the 1800s, and in saying so, hit upon one of the very concepts used in early science and seafaring. The fathom is a unit of measurement believed to have been used in some fashion by many early seafaring cultures. To measure the depth of the ocean, sailors would feed a weighted line known as a lead line over the side of the ship until it hit the seafloor and slackened. As he pulled in the line, a sailor would measure it between his outstretched arms to keep track of the amount of line retrieved and, therefore, the depth of the water. This process is known as taking a sounding. Fittingly, “fathom” is derived from the Old English word “fæthm,” meaning outstretched arms. 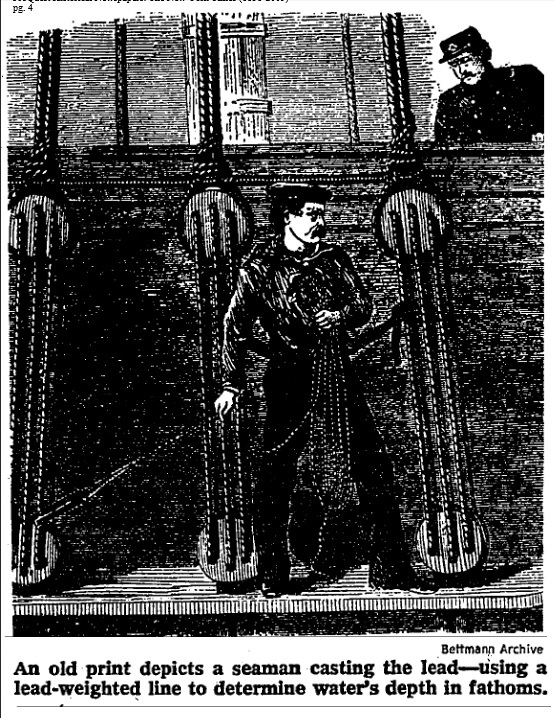 The length of rope that reached across a sailor’s extended arms was equal to one fathom. Sometime during the twelfth century, one fathom was officially defined as six feet. For nearly eight centuries, the fathom was the standard unit for reporting water depth. To reduce human error in measuring depth, flags began to be placed a given number of fathoms apart on the lead line. The HMS Challenger, the first vessel designed specifically for oceanographic research, used fathoms to record sounding data during its 1872-1876 voyages. The Challenger’s flags were spaced twenty-five fathoms apart on a piano wire line, the latest innovation in sounding methodology. The fathom was widely used until the middle of the twentieth century, when the metric system was adopted by the international community. It was officially dropped by the British Royal Navy around 1970, prompting one melancholy member of Parliament to declare that the prospect of “‘bidding farewell to the fathom’” left him “‘with a sorrowful heart’”. This Parliamentarian would be encouraged to observe that the linguistic and scientific legacy of the fathom is far from over. Although contemporary scientists collect soundings with electronic depth finders rather than carefully measured rope, the US National Ocean Service Coast Survey (part of NOAA) publishes some of its coastal depth maps in fathoms. (This is admittedly a curiosity, as virtually every other country uses meters for seafloor maps.) Fathom has most clearly persisted in language. The “come to understand” definition of fathom, a figurative version of the word’s original meaning, was first documented in 1607. Fathoms also inspired the phrases “six feet under” and “deep six,” referencing the number of fathoms at which bodies were required to be buried at land and sea, respectively. In the centuries since seafarers began measuring depth with outstretched arms of rope, oceanographic research has become more sophisticated both at land and at sea. Despite these advances, field oceanography remains challenging, making it easier to fathom the cleverness of those historical mariners. “British Fathom May Go Overboard.” The New York Times. The New York Times, 26 February 1970. ProQuest Historical Newspapers. Web. 19 October 2013. “Fathom Gets the Deep Six.” The Baltimore Sun. The Baltimore Sun, 30 April 1968. ProQuest Historical Newspapers. Web. 19 October 2013. Searle, Roger. “Depth Measurement.” Mid-Ocean Ridges. United Kingdom: University of Cambridge Press, 2013. 11. Google Books. Web. 19 October 2013. Tags: history, oceanography, scientific research. Bookmark the permalink.